South of the Welcome to Fabulous Las Vegas sign and the slot-obsessed zombies of the Sin City Strip, there’s a shopping mall that counts Whole Foods among its tenants. If you’re going to make the drive up the Great Basin Highway in hopes of finding Basin and Range National Monument — the whereabouts of which many locals seem utterly unfamiliar with — you’re going to want to stock up on food and water here, because you probably will (and probably should) get lost along the way. I steered my rented Nissan sedan onto northbound Interstate 15 on a mild day in November, eventually arriving at the juncture for the Great Basin Highway, which is signaled by a massive solar farm, its panels resembling a lake of tar. Past the red-rock canyons, craggy cactuses, stacks of boulders, and Lilliputian forests that populate the landscape, you’ll hit something resembling civilization in the tiny town of Alamo, which hosts a few motels, a cafe, a high school, a gas station-supermarket hybrid and not much else. Shortly thereafter, the highway juts east toward Caliente, marking the most picturesque portion of the drive. On this stretch, I encountered a pair of wild horses — dam and foal, presumably — and a disheveled man hauling a wheelbarrow full of possessions down the highway. He made no attempt to hitchhike or flag down help, and I questioned whether he was an apparition until I saw him again on the way back. By “way back,” I don’t mean on the way back from Basin and Range. I’d overshot my intended Mount Irish access point by about 45 minutes before a kind cashier at a service station near Panaca handed me a map. Basin and Range wasn’t on it, so I set out to find a towering silver alien in front of a Quonset hut on Nevada’s Extraterrestrial Highway, so named because of nearby Area 51. As an El Camino in need of a scrub fired up in a large, desolate parking lot, this sheet-metal symbol of galactic sentience stood in front of the Alien Research Center, a deceptively named retail shop that sells clothing, trinkets, U.F.O. publications and Alien Tequila, a brand the operation’s owner, George Harris, manufactures in Mexico. Manning the front desk was Harris’ brother, Malcolm. A welder by trade, he picks up work where he can and helps George out on weekends. I asked him how to access the grounds of the 704,000-acre national monument, which is roughly twice the size of Los Angeles. He told me I’m “about the second” person to ever make this request of him in the two years since President Obama signed an order protecting the land. Mr. Obama did so at the urging of the former Senate majority leader Harry Reid, a Democrat who represented Nevada, and in spite of vocal opposition from elected officials in Lincoln and Nye counties, where Basin and Range lies. In April, Basin and Range was among 27 national monuments that President Trump instructed Interior Secretary Ryan Zinke to consider shrinking to accommodate fossil-fuel speculation and other private endeavors. In early December, however, it was announced that Basin and Range — unlike similarly designated lands in Nevada and Utah — had been spared manipulation (for now, anyway). 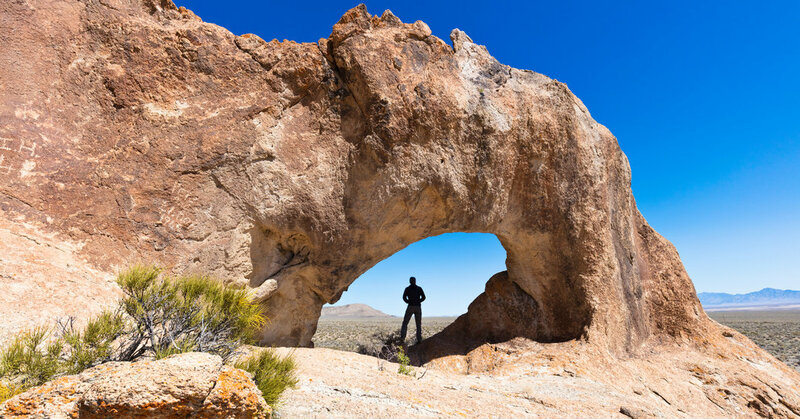 “Every acre of public land is vulnerable until Zinke’s out of the secretary’s chair,” said Patrick Donnelly, the Nevada state director for the Center for Biological Diversity. I followed Mr. Harris’ instructions a short distance up Highway 318 — the road to tiny Hiko, where a lake emerges like a mirage on the right of the highway — to a rusty metal fence. To it was affixed a Bureau of Land Management sticker which requested that I close the gate behind me once I’d driven in. Shortly into my slow, bumpy drive down a rocky road, I realized that I’d have been far better off renting a four-by-four. But the sedan made it through with nary a punctured tire, and there’s something perversely satisfying about taking an ill-equipped car into the sticks and returning it to an airport garage caked in dirt. As I blazed my own trail on foot, I heard nothing, save for a few chatty insects and the wind. Beyond me was sky and rock and unkempt desert. I felt as small as a granule of sand, dwarfed by the natural world. Sinking into the earth seemed a real possibility, and a profound reminder that this ground was not meant for tires or sneakers, but for paws and hooves. It’s this sense of displacement that appeals to people like Jim Boone. A retired biologist and “grizzled old desert rat,” in Mr. Donnelly’s affectionate terming, Mr. Boone lives in Las Vegas, but makes the trek to Basin and Range regularly. Mr. Boone considers has been afforded a private tour of Mr. Heizer’s “City”-in-progress, an experience that changed his opinion of the artist’s quest. Yet Mr. Donnelly dismisses the notion that “City” had anything to do with the monument avoiding Mr. Zinke’s X-acto knife. When “City” is finally opened to the public, it could fulfill Mr. Boone’s prophecy as a magnet for travelers. This may diminish the sense of tranquil isolation felt by previous visitors like Mr. Boone, for whom pragmatism and a willingness to venture further reign supreme.